Life is a matter of fact. The rest is perspective. Better it be a positive one. My day and your day are essentially the same 24 hours. But how I spend it could be so different from yours. taken me along to her afternoon tea with the ladies. Bored by the chitter-chatter of conversations, I wander toward the massive sun-drenched windows framed by delicate lace curtains and peer outside. The sheer white walls of the tent in the backyard are billowing in the warm breeze. A beautiful turquoise rug with an intricate flower pattern covers the floor of the tent, which no-doubt serves as a cool sleeping spot at night. Life was so different then, perhaps because I was young and unaware of the pressures that my parents faced. Or maybe it was just a different way of life. This was a time where none of the modern conveniences were yet known and somehow people managed to go about their days without requiring them. No central air conditioning, dishwashers, food processors. Both my parents worked. So I spent my days with my grandmothers, Nina and Vilik, neither of whom had a car. We walked everywhere and only occasionally took a taxi. The things I often miss are those white tents announcing summertime when we slept outside under the summer stars. I remember playing with the kittens at my Vilik Mama’s house, waiting for the empty pool to fill with snow in the winter and pretending to be asleep during customary afternoon naps at Nina Mama’s. Street vendors offered treats like charred corn dipped into a pail of salt water and whole steamed beets wrapped in newspaper. I can still taste the iced coffee from Cafe Naderi, the creme caramel from Paprika near our apartment and the marzipan-wrapped cake my parents would get from the nearby Danish bakery for my birthday every year. It’s not surprising that food occupies a considerable portion of my memories from childhood in a place where roses, saffron and pistachios are among the most prized commodities. Good pistachios are hard to find these days, especially raw. Most grocers carry roasted and salted/unsalted varieties, which have a longer shelf-life, but these do not have the right flavour for pastries. Lucky for us, specialty merchants offer raw nuts for purchase online. My friend, Cigdem from Why Nut carries high quality hazelnuts and pistachios. And she ships worldwide. The signature elements of Middle Eastern desserts come together in pretty little packages with a subtle, unexpected hint of Earl Grey. A shprinkling of crushed raw pistachios and sparkly glitter contrast beautifully with the crisp white rose-scented icing. A delicate little rosebud makes these sweeties fit for a dainty little princess. Note: The cupcakes pictured here were made using silicone brioche molds that I found at Cost Plus World Market. There are so many choices available in pans with wells in the shapes of flowers, clovers, etc, but a standard cupcake pan works just as well. Using a mortar & pestle, grind the saffron threads with 1 teaspoon of sugar. Add a couple tablespoons of hot water and allow the saffron to steep ~ 5 minutes. In a food processor, grind pistachios with sugar, tea and ground cardamom. Cut a stick of cold butter into small cubes and incorporate it. Finish with the flour and baking powder, mixing they just disappear into the creamy batter. Scoop a couple tablespoons of the batter into each cupcake cups and bake for about 35 minutes. Remove the cakelets from the oven and after about 10 minutes, remove them from the pan and set them onto a wire rack to finish cooling. Prepare the icing with powdered sugar and rose water. Spoon over each cakelets, allowing wavy drippings around the crown. Top with an edible rose bud, a generous sprinkling of crushed pistachios and a pinch of sparkly glitter. It is easy to lose sight of the things that we are fortunate to have. Unlike my grandmothers, I have tools to help make my life easier. I have my own car, 5-burner gas stove and oven, dishwasher, clothes washer and dryer, but am waiting for someone to invent a folding machine, because I hate folding the laundry! Thinking about the simple things that make a child happy keeps us grounded and it is these memories that bring something positive into a dreary day. And, if daydreaming fails, baking is great therapy. Saffron Tea Cakes take me back to those afternoon tea parties with my grandmothers every time I make them. « Maille Salmon: Foodie Giveaway Announced! What a lovely glimpse into you childhood and the happy (and delicious) memories 🙂 these cakes are SO pretty and such gorgeous flavors – this post was a treat! Dear Colette, as I mentioned on FB already, these are such very pretty cakes – about two months ago I baked a Persian Love Cake for a wedding anniversary and I used saffron, pistachios and dried rose buds as well – so I know that your little tea cakes must be utterly delicious – I have to give them a try with good quality ingredients! What a wonderful post that takes us back to your childhood – I really enjoyed reading it! And thank you also for all your kind and thoughtful messages – they meant so much to me. Feel yourself hugged, take care and have a wonderful weekend! So pretty. I love these elegant little cakes that you made. I have thsoe same little roses in my pantry that I was not sure what to do with. Okay so I love this recipe. You know I'm a huge pistachio, well, nut. I love them far too much. And what a cool way to grow up. It sounds like such a great place, and great memories. Seriously pretty recipe. Totally loving this. Andrea doll, what a blessing to have you back! I truly missed hearing from you and am so relieved you are well. Kimmy, you always manage to make me smile! I'm so very lucky to have a wonderful family and a wonderful childhood. I wish that for everyone. Beautiful little cakes, quite unlike anything I've ever seen! This is a beautiful post. It brought back memories of my childhood too. Of course yours is very interesting. Those were the days……Only if we could turn the clock backwards to those times.. AND this recipe is awesome. Looks so elegant and Ithe tastes must be out of this world with rich combination of saffron, pistachios and rose water. Well done dear. The pictures look so professional. Lovely Post!!!!!! Thank you for sharing. So dainty looking and I would do some bad damage to them! Thans for sharing your beautiful memories! These cupcakes look wonderful. I love saffron and pistacios, but I have no experience using rose water. Hi, Laura. Thanks for stopping by so I could “meet” you. Love your blog, too. Rose water is lovely. Look for it at Middle Eastern grocery stores. Don't buy it from fancy cooking stores as it can be overpriced. And remember, a little goes a long way. Enjoy! Oh my oh my, dear Colette!! I am speechless at the combination of saffron, pistachio and rosewater cake. I want to jump out and make these tea cakes right away. Divine. I will surely make them one of these days and off course let you know. By the way, love your opening. Life is truly a matter of fact and the 24 hours we have are same but it's our attitude towards life that make each of us spend it differently. Also, I recently discovered the what it takes to make a little two year old happy. It isn't much, is it? Lailie doll, they're so easy, you're going to love them even more! So glad you can relate. Yes, toddlers are very cute little people. My Daisy would rather play with the plastic pasta scooping spoon thingy than any of her bazillion toys! I like the way how you enjoyed your saffron tea cakes and see the past and presents and look forward feeling fortunate with everything that we have. Hi there! First time at your blog and I loved what greeted me – saffron tea cakes! Saffron happens to be my most loved spice. I can't help using it for savories and sweets. 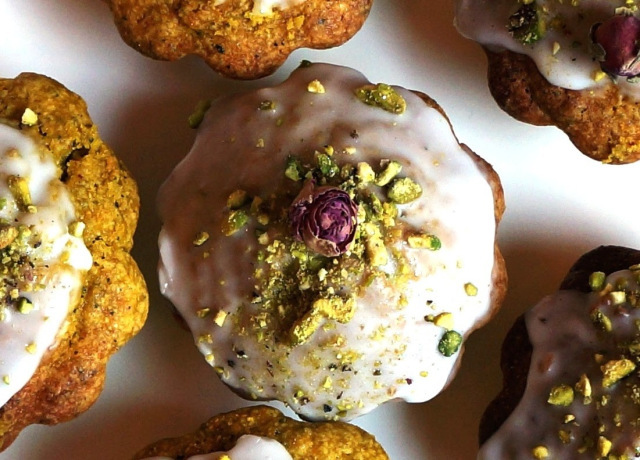 Your saffron tea cakes sound amazing and I think I will give them a try soon. I love reading the stories about your childhood in Iran. So sweet. Just like these Saffron Tea Cakes.